Bright Lights in the Lab takes place at University of Toronto Schools, from July 6-17. More than 60 high school students ranging from Grade 7 through 12 will work with teachers, PhD's and graduate students from U of T to perform science experiments on behavior, learning and memory. This year, Firefly has received support from Fulbright Canada and the Rotman School of Management's GBC outreach program to provide scholarships and bursaries to 15 students with limited resources, but who love science and demonstrate great academic potential. "Our goal has been to bring together kids interested in brain science and all its wonders, so we can inspire them to follow their dreams." says Heather Fraser, Founder of Firefly Foundation. "It's incredible to see their curiosity and resourcefulness at work." Neuroscience remains a new frontier. These young students are starting to face the reality of how 'old people's diseases' can have an impact on their current and future quality of life. By learning about the brain and performing experiments, these students learn the skills needed to channel their passion for learning into a future where they could be the ones to find a cure of treatment for neurodegenerative diseases like Alzheimer's. "Designing experiments—recording from neurons and measuring changes in behavior in response to environmental stimuli or drug application—are game-changers for a high school student," says Anand Mahadevan, Camp Director, "It takes them away from cookie-cutter school labs and brings them closer to inquiry-based thinking which is critical to success in science." "Their enthusiasm and curiosity creates hope and excitement about the future of neuroscience in Canada. Parents & grandparents should be so proud of them", says Fraser. "As we scale this camp and expand it across Canada, our next quest is to offer these students university scholarships. They give us all hope for the future." The Fulbright Canada Community Leadership Program, which is co-sponsored by the U.S. Embassy in Canada and Fulbright Canada, provides an opportunity for Fulbright Alumni the opportunity to take action, get involved, and help make your community and the world a better place. In 2015 our Camp Director, Anand Mahadevan, received funding to provide full scholarships for 8 students to attend our program. For the second year we received continued support from the Rotman School of Management Graduate Student Business Council enabling us to provide and additional 8 students to receive bursaries. We are very grateful for the support of our sponsors. 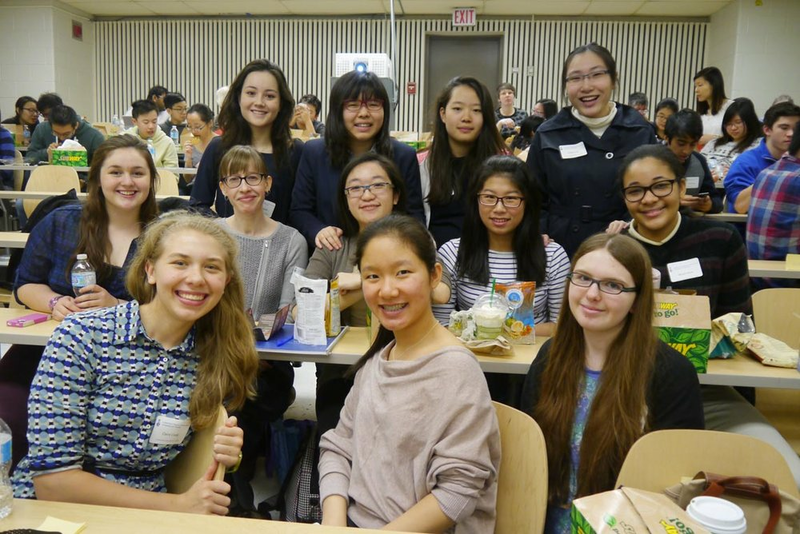 In 2015, 14 high schools, with 48 students competed and following three rounds of competition the winners were: Shannon Eagan (first place), Laura Newcombe (second place) and Ruby Zhang (third place). Both Shannon and Ruby were from University of Toronto Schools, while Laura was representing North Toronto Collegiate Institute. The Top Ranking Novice Participant Award went to Justin Lu (Upper Canada College). For Shannon, the 2015 Brain Bee challenge was her third time participating at the event, reinforcing the saying that “third time’s a charm” with her first place win this year. However there was nothing “lucky” about her success as her experience in previous events and preparation for this year’s competition attend. Shannon leads a club for Brain Bee preparation at UTS. Currently in Grade 12, she is planning a future in neuroscience and will be attending McGill this Fall. Her advice for future Brain Bee competitors is to go deeper into the textbooks, to make connections between topics and chapters and to investigate material beyond the book! Laura single handedly represented her school, North Toronto Collegiate Institute. Her motivation largely stemmed from a desire to learn, of knowing for the sake of knowing. She has twice reached the finals at the Spelling Bee of Canada competition, and found the Brain Bee a good next step. She plans to study architecture at the University of Waterloo. The Toronto Brain Bee likes to recognize first time competitors and this year the top ranking novice participant Justin described his time at the Brain Bee as an eye opening experience. During the past school year, Justin and fellow student Elliott Birman, started a Neuroscience Club with the goal of getting other students interested in the science of the brain. We hope Justin will return for the 2016 competition. Between the competition rounds, two short research presentations were given and lunch was provided for all of the competition participants, high school teachers and volunteers. Following the competition, all the participants were invited to visit the Anatomy Museum in the Medical Sciences Building. Students from Branksome Hall also enjoyed a strong presence at the competition with 12 participants and their teacher Chandra Boon. 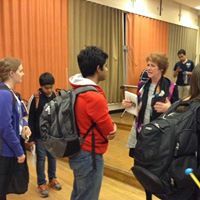 The school first participated in the Brain Bee in 2014, leaving their contestants feeling they were not fully prepared. Not this year ! A Neuroscience club was formed, with three club heads — Ashley, Natalie, and Destiny — that hosted various group preparatory events for this year’s Brain Bee competition. The students took turns giving presentations on each of the topics and chapters from the Brain Bee learning materials, and recognized areas that warranted particular focus and study. We would like to thank Nestle for there generous support of this event. On June 25th we gathered in the art studios at University of Toronto Schools to work with students and learn what they think young people would like to know about the brain... and how they's like to receive & use this information. This event was one of many held during 2014 as part of our Bright for Life project. I am a quiet high school student interested in pursuing a career in the sciences. I find the universe fascinating and seek to learn as much as possible about the world that I live in. My spirit is dynamic; besides my love for knowledge, I also have a penchant for art, video games, and weird things. You can often find me with my nose buried in a book or with a pen in hand, drawing or writing down thoughts and story ideas. In my spare time, I sleep. I believe that truth is the highest power. The Firefly Foundation was a proud sponsor of the 16th Annual Toronto Brain Bee. 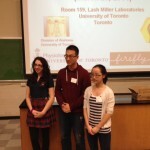 The competition took place at the Lash Miller Chemical Laboratories at the University of Toronto on March 28, 2014. 55 students from 15 high schools in the Toronto area participated in the competition. Following three rounds of questions, the top three winners were: Michael Liu (first place), Catherine Hu (second place) and Andrea Zukowski (third place). Michael and Catherine were from the University of Toronto Schools, while Andrea was representing the Cardinal Carter Academy for the Arts. As the first place winner, Michael Liu will represent Toronto at the 7th Annual CIHR Canadian National Brain Bee competition, which will take place at McMaster University in Hamilton on May 31, 2014. Last July 42 future scientists joined together in the lab to undertake their own research experiments. Bright Lights in the Lab enables high school students to experience the full research cycle: conduct literature searches; organize & execute research plans; deliver a report on their findings; meet, collaborate and work with current researchers and academics from the University. In the process, they learn to work productively and creatively in an increasingly complex environment; develop critical problem solving skills; and gain an introduction to the scope of possibilities in a career in science. 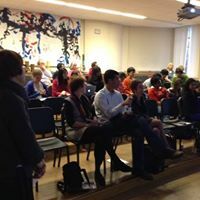 The aim of Bright Lights is to enable students to emerge from the program more knowledgeable, skilled, connected and confident with an understanding of the foundational scientific research principles required for success in the lab… today & tomorrow. Firefly is a proud sponsor of the Toronto Brain Bee, a knowledge-based competition for high school students. It tests the knowledge of the students in neuroscience. The first place winner Sophia Ly will represent Toronto at the 6th Annual CIHR Canadian National Brain Bee competition (www.brainbee.ca), which will take place at McMaster University in Hamilton on June 1, 2013. The 2013 Brain Bee competition was jointly sponsored by the Collaborative Program in Neuroscience, the Department of Physiology and the Firefly Foundation. The students were welcomed by Professor Zhong-Ping Feng (Coordinator of Toronto Brain Bee, Department of Physiology), Professor Steve Matthews (Chair, Department of Physiology), and Sharon Zillmer (Manager, Firefly Foundation). The Brain Bee competition was hosted by Andrew Barszczyk (Graduate student, Physiology) and Danielle DeSouza (Graduate student, IMS). 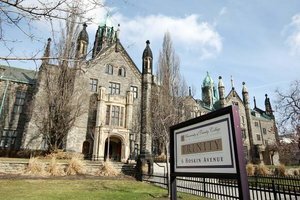 Between the first and second rounds of questions, the students visited the Anatomy Museum at the Division of Anatomy, watched a Firefly video presentation of 2011 Toronto Brain Bee, and mini documentaries created with the top 3 competitors that year. 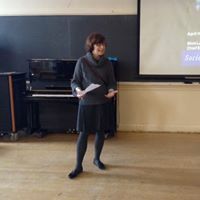 Three short research presentations were given by Rachel Newsome (Barense lab, Psychology), Catharine Mielnik (Salahpour lab, Pharmacology) and Nancy Dong (Feng lab, Physiology). who won the 2012 brain bee? The first place winner David Kim will represent Toronto at the 5th Annual CIHR Canadian National Brain Bee competition, which will take place at McMaster University in Hamilton on May 22, 2012. In 2011 David placed second and was featured in a Firefly mini-documentary entitled Where Does Your Memory Live? Jessica Zung placed second for two straight years. She also worked with Firefly to create a mini-documentary entitled You Can’t Always See What Hurts, and what she has learned about how depression affects your brain. This show was organized by a small team from the graduating class of 2011. Danielle, Leela and Oliva… our hats are off to you for doing an outstanding job and making this such a successful event. The Dancers displayed such talent, and your choreographers had so much to be proud of. The emcee’s stole the show and the great energy of everyone involved was matched with the enthusiasm of your audience. 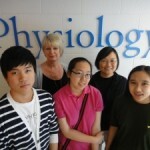 Soohyun Park assisted in Dr. Feng’s laboratory in the Department of Physiology at the University of Toronto. Follow her through the lab where she worked with Nasrin Nejatbakhsh (PhD Candidate) to learn how a snail can help scientists understand how cells regenerate and why it is important to protect your brain. David Kim placed 2nd in the 2011 Brain Bee. That summer David gave us an inside look at his summer internship at the Memory Lab, working with Dr. Sheena Josselyn's team, exploring how your brain stores memory. We followed Jessica Zung, a Grade 12 student from UTS, as she accompanied Sakina Rizvi (PhD Candidate in the Kennedy Lab, Pharmaceutical Sciences and Neuroscience at the University of Toronto) throughout an exploration on how depression affects our brain. There were 62 students from 16 high schools in the Toronto area who participated in the competition. Between the first and second rounds of questions, the students visited the Anatomy museum at the Division of Anatomy, watched the video of 2010 National Brain Bee event, and listened to short research presentations from five graduate students. On January 16th, during Alzheimer Awareness month, young bright brains from the Toronto French School chose Firefly as their charity of choice for their annual Dance Show fundraising event. The student-led event sold out with over 200 families and student in attendance and raised $6000 dollars in the process. “Overall, the students and dancers are the epitome of great brain health; bilingual, fit, and not afraid to take on a challenge. They’re an inspiration to all generations.” As quoted by Heather Fraser, Founder and Chair of the Firefly Foundation. It was the feedback from both students and teachers that become the genesis for high school program targeting teens teaching the merits of good brain health.